Coat skillet with cooking spray: place over medium heat until hot. Cut chicken in to bite size pieces and sprinkle with pepper: Sauté chicken until lightly browned. Remove from skillet and set aside. Sauté onions and garlic in skillet. until browned. Add chicken, mushrooms, tomatoes, bay leaf, salt and wine. Stir well. Simmer uncovered 15 minutes. Spoon fettuccini out onto serving platter. Remove bay leaf. 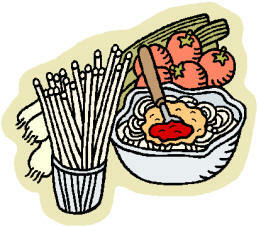 Arrange chicken & vegetables on noodles-sprinkle with parsley. 6 Servings 271 Calories per cup.